Ukraine’s clan networks are re-asserting their power again. Western partners need to think carefully about whom to support and how. Roman Nasirov, Ukraine's former tax and customs chief who is being investigated for misusing public office, is now under house arrest. (c) NurPhoto/SIPA USA/PA Images. All rights reserved.Strange things are happening in Kyiv. In spring 2017, two prominent Ukrainian politicians — Mykola Martynenko, a former MP, and Roman Nasirov, former head of country’s fiscal service — were arrested on corruption charges to significant fanfare. 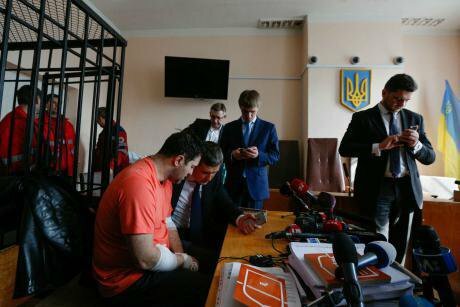 Soon, however, both men were released: Nasirov on a bail of UAH100 million (£2.9m) paid by his wife, and Martynenko without any bail. While the cases remain under investigation, the two suspects are free to move. What does all this mean? A recent book outlines, in detail, a new theory of post-Soviet political rule and helps to explain the curious contradictions in Ukraine’s politics today. In 2015, Henry E. Hale, a political scientist at George Washington University, published a ground-breaking monograph under the intriguing title Patronal Politics: Eurasian Regime Dynamics in Comparative Perspective. In this broad study of post-Soviet socio-economic and political life, Hale lays out a comprehensive re-interpretation of state-society interactions, oligarchic rule, center-periphery relations, presidential as well as economic power, parliamentary affairs, party building, policy formation and media landscapes, in the USSR’s successor states. Here, Hale demonstrates the universal salience within the political process, and deep penetration into many social spheres, of patron-client relationships, clan-like networks and rent-extracting mechanisms. This allows him to assert the existence of hidden regimes in these countries — where political competition and decision-making happen via processes incompletely or not at all reflected in the officially recorded actions of state institutions, political parties and civic organisations. Moreover, this regime type is partially dissociated and independent from the familiar distinctions, in western political science, between totalitarian, authoritarian, hybrid and democratic rule. 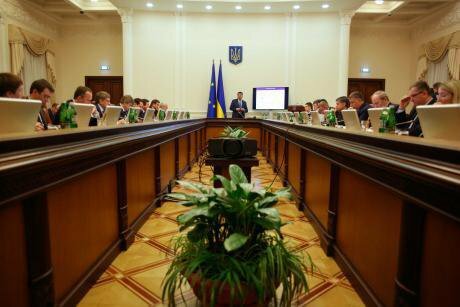 April 2017: the Ukrainian government holds a session on mid-term strategy for 2017-2020, Kyiv. (c) NurPhoto/SIPA USA/PA Images. All rights reserved.Instead, in patronal political regimes, power is accumulated and exercised through more or less successful building, maintenance and interaction of distinctly informal and frequently interlocking pyramid structures headed by men (and sometimes, women) at the helm of large economic conglomerates, regional political machines, or central state administrations. It is less the official position of the patron or oligarch that gives him power than the capacity of being the boss of such a semi-secret pyramid structure that, in turn, often consists of smaller pyramids headed by sub-patrons directing separate circles of clients. Typically, the most powerful of these networks reach into a broad variety of social institutions ranging from ministries, agencies and parties to companies, media outlets and NGOs. The glue that holds these complicated coteries together are less institutional hierarchies than familial ties, personal friendships, long-term acquaintances, informal transactions, mafia-like behaviour codes, accumulated obligations, and withheld compromising materials (kompromat). These networks are designed as unofficial mechanisms for the exchange of posts, money, real-estate, goods, services, licenses, grants and favours. At the core, they are more or less manifestly criminal corruption schemes which constitute the core and purpose of much of post-Soviet patronal politics. Intriguingly, these mechanisms can and do function not only via autocratic, but also through seemingly democratic procedures. In fact, genuine public support for, and apparent electoral successes of, a country’s political super-patron (e.g. the president), as well as regional or local patrons are crucial prerequisites for the acquisition and preservation of their power. No wonder that one of the major slogans of Ukraine’s 2013-2014 anti-oligarchic Revolution of Dignity was “Banda – het’!” (“Away with the gang!”) Former President Viktor Yanukovych’s biological family, in conjunction with a larger network of friends and comrades, had become so greedy and unashamed in their plundering of the Ukrainian state — as well as so brazen and ruthless in the defense of their kleptocratic rule — that millions of citizens across the country decided to participate in a three-months long and eventually bloody uprising against his clan. Yet behind the scenes, some other oligarchs also supported the upheaval from the beginning, or later switched to supporting it, as predicted by Hale’s theory of patronal politics. This became apparent when, in spite of the outspokenly anti-oligarchic direction of the protest, the “oligarch” Petro Poroshenko — elected on a platform of peacemaking in eastern Ukraine — replaced Yanukovych as Ukraine’s super-patron. Poroshenko’s candidacy for president had been decided at a semi-secret meeting between him, Ukraine’s most notorious oligarch Dmytro Firtash and the then front-runner Vitalii Klychko, in Vienna on 24 March 2014 — one month after the victory of the EuroMaidan. This cabal as well as some other suspicious events during this period had raised doubts about the supposed regime change in the aftermath of the Revolution of Dignity from the start. 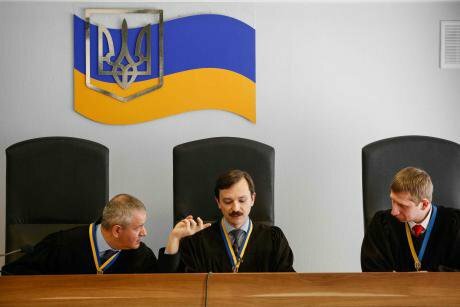 May 2017: Obolon district court, Kyiv continues the preliminary hearing of ex-president Viktor Yanukovych's high treason case. (c) NurPhoto/SIPA USA/PA Images. Some rights reserved.To be sure, Poroshenko has proven to be much different from Yanukovych in terms of the ideology and sophistication of his rule. Under the pressure of Ukrainian civil society, western states and foreign financial donors, he has not only passively allowed, but also actively promoted considerable administrative and economic reforms. Both domestically and internationally, Poroshenko has proven to be Ukraine’s most professional and flexible president so far, maneuvering the country through an exceptionally difficult period of concurrent foreign invasion, economic collapse and social transition. During his first three years of rule, Ukraine has made remarkable advances in, for instance, the reform of its energy sector, modernisation of its armed forces, improvement of its relations to the West, remaking of its once notorious police force, resetting of its public procurement system, and decentralisation of its state apparatus. Some further deep transformations in various fields, including public health and higher education, are on their way. 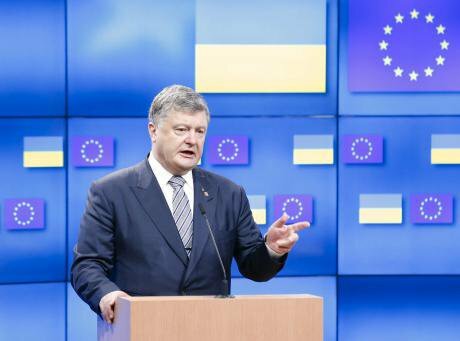 Under Poroshenko, Ukraine and the EU have completed the conclusion of an exceptionally large Association Agreement that is almost fully ratified now, and a demanding Visa Liberalisation Action Plan (VLAP) that has been allowing Ukrainians, since June 2017, to visit the Schengen zone, for short terms, visa-free. Yet the pre-history of Kyiv’s recent historical achievements with Brussels also illustrate a fundamental risk in Ukraine’s apparent Europeanisation. Oddly, the Association Agreement had been negotiated and the large treaty’s text was already initialled under Yanukovych. The gradual implementation of the VLAP too had started long before the victory of the Revolution of Dignity. Both of these stories indicate that pro-European political action is not necessarily an expression of sincere intention. And when it appeared to him necessary, Yanukovych postponed the signing of the Association Agreement at the eleventh hour. Nevertheless, Yanukovych’s kleptocratic regime paradoxically played a temporarily constructive role in the rapprochement between Ukraine and the EU. Puzzlingly, Yanukovych and his coterie co-prepared Ukraine’s recent foreign affairs triumphs. All that did not prevent his clique to simultaneously conduct one of the largest robberies of state funds and property in modern history. The Poroshenko story now repeats, on a smaller scale, this paradox. Poroshenko’s regime too delivers contradictory results. It first allows, in line with western expectations and demands from civil society, the law-enforcement agencies to spectacularly arrest Nasirov and Martynenko. Yet later on the same regime sets the suspected robbers of millions of state funds free. You could observe such contradictory developments in many affairs of post-EuroMaidan Ukraine. Against the background of Hale’s theory of post-Soviet patronalism, these contradictions aren’t that much of a surprise. Within a patronal political regime, officially pro-western foreign policies may easily co-exist with hyper-corrupt policies at home, as long as this tension does not touch upon the ruling clan’s financial and other interests. Even apparently substantive domestic reforms can be conducted by a patronal regime, if there is an opportunity to secure the coherence of the ruling informal pyramid and preserve at least some core sources of power, influence and income. This trick can be accomplished, for example, via separation, insulation, imitation, dilution, prolongation, limitation or manipulation of a reform. They allow the patronal regime to gradually adjust to a transformed state of affairs, to invent anew or reinvent old rent-extraction schemes, and thus to adapt the structure as well as functioning of its ruling pyramid to novel circumstances. In such cases, visible foreign and internal successes will be useful to a governing clan network as their domestic and international popularity may increase the legitimacy and stability of its corrupt practices at home. The successful completion and survival of such a gradual transmutation will demonstrate the regime’s adaptability as well as resilience. It can thereby increase the self-confidence, combativeness as well as longevity of an incumbent patronalistic government. Is the EU’s extension of visa-free regimes eastwards more about managing migration flows than European values? (c) Ye Pingfan/Xinhua News Agency/PA Images. All rights reserved.This rejuvenation of the functioning, as well as rebranding of the public image of Ukraine’s post-Soviet oligarchic rule, is what Poroshenko has been trying to accomplish over the last three years. At least, this is the conclusion that suggests itself against the background of the increasingly scandalous actions of the president and his accomplices in government, parliament and mass media directed towards limiting, diluting and discrediting Ukraine’s officially announced anti-corruption drive. The regime’s problem with the accelerating move towards the punishment of corrupt officials is that it not only threatens members of the formerly dominant Donetsk clan of Viktor Yanukovych. It now also touches more and more directly core members, sub-patrons and key clients of Poroshenko’s ruling network. The recently accumulating anti-corruption measures (i.e. new regulations and institutions fiercely defended by an increasingly impatient civil society and demonstratively supported by various western institutions) have created some dangerous momentum. Their further attack on Ukraine’s various corrupt schemes could weaken the Poroshenko clan vis-à-vis other networks, like those of former prime-minister Yulia Tymoshenko, in the wake of the 2019 presidential elections. Or it could even mean the start of the dismantling of the patronalistic regime altogether, and its step-by-step replacement with a political system containing real political parties, and regulated by the rule of law. Both of these outcomes would mean the end of Poroshenko’s oligarchic rule — unless Poroshenko decides to put himself at the helm of the anti-corruption campaign. The latter is unlikely. It is a choice that Poroshenko has had time to make already for more than three years by now. That the current Ukrainian president would go this path was the hope of many (including myself) in 2014. Yet given Poroshenko’s ambivalent past before the Revolution of Dignity, and curious rise to power in spring 2014, the chances for such a development were always slim. Rather, Poroshenko was and remains one of Ukraine’s notorious oligarchs who more manifestly than others combined official political posts with continuing economic activity in the food and automotive industry, as well as in television. While he has been a less scandalous figure than, for instance, Rinat Akhmetov and Dmytro Firtash, his richer competitors and notorious co-oligarchs, Poroshenko is flesh of the flesh of the old system and its patronal politics. He was one of the co-founders of the notorious Party of Regions dissolved after the Revolution of Dignity. During the acrimonious infighting between Ukraine’s officially pro-western political forces after the 2004 Orange Revolution, Poroshenko functioned for a while as president Viktor Yushchenko’s attack dog in the latter’s attempts to oust or prevent Tymoshenko as prime minister. He was a minister under both Yushchenko and Yanukovych while, at the same time, continuing to develop his various business-interests. Poroshenko’s candidacy for, and assumption of, Ukraine’s presidential office was apparently the result of the already mentioned shady post-EuroMaidan deal between him, Firtash and Vitaly Klitschko. The latter was then still a largely extra-systemic politician who had not or only to limited degree participated in Ukraine’s informal exchange mechanisms. The former boxing champion had become the prime contender for the presidency already before the Revolution of Dignity, according to opinion polls. Yet, for still not fully disclosed reasons, Klitschko — during the dubious meeting with Poroshenko and Firtash in Vienna in March 2014 — agreed to put forward his candidacy merely for the post of mayor of Kyiv, thus opening the field for Poroshenko as the main candidate of Ukraine’s pro-western forces for president. Within only two months, Poroshenko’s campaign managed to secure for him a victory already in the first round of the presidential elections in May 2014. Arguably, Poroshenko had already made the crucial step in defining the nature of his five-year presidency immediately after the election. When he successfully pushed for snap parliamentary elections for October 2014, Poroshenko failed to combine this, by itself, timely and apt move with an attempt to change Ukrainian electoral legislation. This left the previous mixed system for parliamentary elections, in which half of the deputies are elected proportionally via closed party lists and the other in single-member districts, in place. 23 March: two MPs from Petro Poroshenko Bloc vote for amendments to the law on combating corruption on behalf of absent colleagues. Both of these mechanisms had earlier proven to be beneficial to the preservation of Ukraine’s old clan structures and patronal politics. The closed-list system allows parties to sell positions on their lists to the highest bidder. Majoritarian elections in provincial electoral districts, in turn, are hampered by the scarcity of effective NGOs, political organisations, mass media, critical observers, independent entrepreneurs and legal expertise outside Kyiv and some other large cities. The flattened civic landscape, local concentration of power, and semi-anarchical state of affairs in many Ukrainian regions allowed resident strongmen and/or particularly well-financed contenders to manipulate the electoral campaigns and processes there to such a degree as to make just and meaningful political competition difficult. To date, a long-discussed new electoral law providing for open party lists, and other safeguards against manipulation during Ukraine’s next parliamentary elections in 2018, have still not been passed. Moreover, since early 2016, there is a more and more obviously concerted campaign under way that aims to complicate, control and/or defame the work of various Ukrainian officials, activists and institutions engaged in the limitation or extermination of corruption. For instance, one of Ukraine’s most famous journalists and MPs engaged in the disclosure of various bribing schemes and other secret political deals, Serhiy Leshchenko, became, during 2016, the target of a purposeful libelling campaign. Leshchenko’s credibility and independence was questioned in connection with the acquisition, by him and his girlfriend (a successful Ukrainian DJ), of a flat in downtown Kyiv. More recently, the government-controlled factions in Ukraine’s parliament have engaged in manipulation of the procedure and results of the appointment of the head of the supervisory board that will oversee the activity of the most reputed Ukrainian governmental anti-bribery institution, the National Anti-Corruption Bureau of Ukraine (NABU). 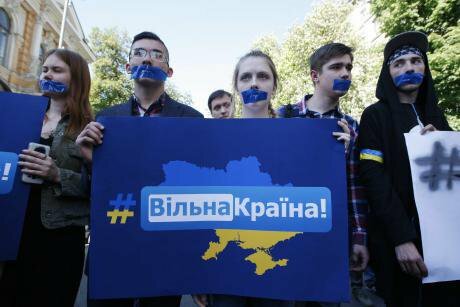 May 2017: Ukrainian citizens rally against a presidential decree blocking the operation of Russian social networks in Ukraine. (c) NurPhoto/SIPA USA/PA Images. All rights reserved.Most worryingly, in April 2016, the Verkhovna Rada adopted a dubious amendment on the Ukrainian law on electronic income and asset declarations for Ukrainian state officials. Now, not only Ukraine’s president, ministers, MPs, bureaucrats and other governmental employees will have to make their personal financial situation public, but also an ill-defined circle of Ukrainian anti-corruption NGO leaders. This extraordinary new regulation picks out (by way of proceeding from an assumption of their possible guilt) anti-corruption activists from all other Ukrainian non-governmental actors who do not have to declare their personal income and assets. It forces an already especially embattled and threatened circle of Ukrainian civic leaders to disclose their private financial situation, even if these persons are not engaged in the administration and distribution of Ukrainian tax money and public funds. This new rule doesn’t only create practical hindrances for monitoring and investigative organisations. It also leaves the unhealthy impression that anti-corruption activists need to be especially supervised by the government — an approach that turns the interaction between civil society and the government, in a modern democratic state, on its head. To be sure, it may well be that anti-corruption campaigns are misused for other purposes. It does not take much fantasy to imagine (and is fully in line with Hale’s theory of patronalism) that Ukraine’s crafty oligarchs and “political technologists” will be or already are utilising fake civic groups to attack their economic competitors or political foes under the pretext of a supposed fight against bribery. Yet such possible defamation and similar campaigns need to be prevented and fought against. Anti-corruption initiatives should not be hindered by government intrusion that assumes the possible misuse of civil society for private or political gains, with regard to all anti-bribery NGOs, independently of any serious allegations of misbehaviour or not. Graph: The Index for Monitoring Reforms from VoxUkraine and Interfax Ukraine, which measures experts’ perceptions of governmental reform activity in various fields, shows a constant lowering of the Ukrainian reform drive, between early 2015 and mid-2017. As the revolutionary enthusiasm of EuroMaidan has faded in recent months, Ukraine’s patronalistic regime is more and more openly fighting back. At least, that is the impression from the above and a number of other recent developments. Ukraine’s clan bosses are increasingly feeling the heat of the multiple reforms going on in a wide variety of fields since 2014. They are especially concerned about the accelerating fight against political graft, informal deal-making, and large-scale bribe-taking. Perhaps their various attempted and partially successful countermeasures can be even seen as positive signs. They signal the (at least, potential) effectiveness of the new anti-corruption institutions, regulations and organisations. In this escalating battle, western donors and embassies need to make sure that they end up on the right side of the barricade. The current political turmoil in the United States and European Union is not conducive to well-informed and differentiated decision-making. Washington and Brussels are currently facing a whole array of competing domestic and foreign challenges — Trump/Russia collusion, Brexit, the war in Syria, North Korea’s nuclear programme, nationalist diversions in Hungary and Poland, to name a few. They distract the attention of western governments, organisations and publics from the intricacies of Ukrainian domestic affairs and general complexities of post-Soviet patronalistic regimes. But Ukraine is too important a country for the future of Europe, and the window of opportunity has too many geopolitical consequences to be missed. The hidden conservation and restoration tendencies that are currently underway in Ukraine have been labelled by Ukrainian historian Yaroslav Hrytsak as the “sweet counter-revolution” (in reference to Poroshenko’s confectionary business interests). Ukrainian civil society is gearing up for a new confrontation with the old system, and needs western help in finishing the job. To be sure, governmental foreign actors and development agencies are usually prescribed to cooperate only with their counterparts in the Ukrainian government and above all the presidential administration. Today, though, this general rule needs to be applied with more caution than ever. 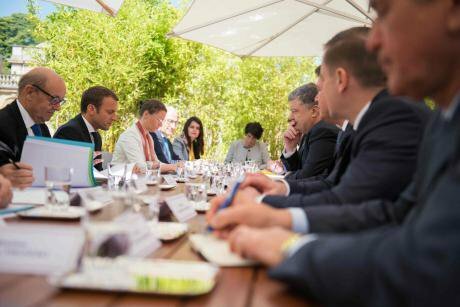 26 June 2017: French president Emmanuel Macron meets Ukrainian president Petro Poroshenko. (c) Blondet Eliot/ABACA/ABACA/PA Images. All rights reserved.Many Ukrainian executive, legislative and judicial organs (numerous state offices, services, ministries, agencies, courts) as well as sometimes even non-governmental allegedly not-for-profit organisations remain, to one degree or another, infiltrated by private interests. Western donor organisations and developmental programmes should thus support these institutions neither symbolically, nor practically and — least of all — financially. Help should only be given conditionally, to carefully examined projects. It should be only transferred via the trusted hands of reputed officials, some of which have recently left government. The remaining are under increasing pressure from their old-system colleagues, as illustrated, for example, by the sad regress, since early 2016, in one of Ukraine’s most reformist post-EuroMaidan governmental institutions and once foremost drivers of transformation, the Ministry of Economic Development and Trade. At the end of the day, the West’s prime attention, in these matters, should concern the country’s president. Poroshenko’s behavior, rhetoric and fate will determine, to a large degree, where the country goes. While being an archetypal oligarch, Poroshenko is a flexible and smart politician who is able to better calculate his fortunes than his rather primitive predecessor Yanukovych. Poroshenko needs to be made understood that the war in the Donets Basin and general confrontation with Russia cannot serve as an excuse for even a partial preservation of Ukraine’s old patronalistic system. western diplomats, politicians and donors should not hide that recent aberrations, like the above-mentioned ones, are being carefully noted as well as fully understood. It should be made clear to the president and his comrades-in-arms that those who are responsible for old or new violations will eventually, in one way or another, be punished, by the West — if not today, because of the war, then later on, once the war is over. Last but not least, the West’s national governments and international organisations should get their own houses in order. We need to get serious about those western banks, firms and various other private as well as sometimes even public actors who are more or less knowingly involved in the post-Soviet elites’ securing, hiding and laundering of improperly earned money. As Henry E. Hale’s book makes clear, patronalism, informal exchanges and clan-networks are not phenomena exclusive to formerly communist countries. The West cannot demand from Ukraine and similar countries a more resolute fight against corruption while continuing to go soft on the various western companies and groups involved, in one way or another, in dubious deals with likely criminals from the post-Soviet world.